Straight ramps used to construct an Egyptian pyramid. As the pyramid gets higher, the ramp is made longer, to maintain a manageable slope of the inclined plane. The inclined plane is one of the classical simple machines. As the name suggests, it is a flat surface held at an angle to the horizontal. By moving an object up an inclined plane rather than directly from one height to another, the amount of force required is reduced, at the expense of increasing the distance the object must travel. Some examples of inclined planes are a children's slide, a loading ramp, aircraft wings, windmills, and propeller blades. 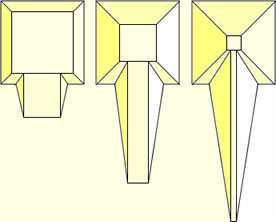 Examples of various types of ramps used to construct pyramids. From left to right: Zig-zagging ramp (Holscher), ramp utilizing the incomplete part of the superstructure (Dieter Arnold), and a spiraling ramp supported by the superstructure (Mark Lehner). The inclined plane is one of the simple machines of antiquity. Their physical operations were first theorized by Archimedes in the second century B.C.E., then further explained by Hero of Alexandria in the first century C.E. Around 2600 B.C.E., inclined planes in the form of ramps were used, at least in part, to raise the blocks of stone that make up the Great Pyramid. Between 1900 and 1400 B.C.E., inclined planes might also have been used to elevate and place large stone crosspieces at Stonehenge. Before the advent of inclined planes, levers, pulleys, cranes, gears, and belts, heavy objects had to be hoisted, moved, and positioned by brute force. Examples where "inclined planes" are to be found include ramps, sloping roads, hills, windshields, funnels, children's slides, water slides, and carpenter's planes. Other examples include aircraft wings, helicopter rotors, propellers (for aircraft and boats), windmills, water wheels, turbine blades, rotary fan blades, and machine screws. A wedge may be thought of as a portable, double inclined plane. It is used to separate two objects, or portions of objects, through the application of force. Examples of wedges include axes, spears, arrowheads, chisels, hatchets, and air hammers. Yet there is a difference between a stationary inclined plane and a wedge. While a load is moved along a stationary inclined plane, a wedge itself moves a stationary load. f = frictional force of the inclined plane. When an object is moved up an inclined plane rather than vertically, the amount of force needed is reduced, but the object has to be moved through a longer distance. As a result, the amount of mechanical work done in moving an object up an inclined plane is the same as the work needed to lift the object vertically. The mechanical advantage of an inclined plane is the ratio of the length of the sloped surface to the height it spans. It may also be expressed as the cosecant of the angle between the plane and the horizontal. the frictional force ('f') acting parallel to the plane. The gravitational force may be visualized as having two components: A force parallel to the plane ('mgSinθ') and a force acting into the plane ('mgCosθ') which is equal and opposite to 'N'. If the force acting parallel to the plane ('mgSinθ') is greater than the frictional force 'f', then the body will slide down the inclined plane; otherwise, it will remain stationary. When the slope angle ('θ') is zero, sinθ is also zero so the body does not move. ↑ BookRags. 2007. Inclined Plane World of Invention. Retrieved November 18, 2007. This page was last modified on 28 February 2018, at 19:40.